WILD PLAY DAYS are run regularly through the holidays for primary children 5 and up. We welcome children returning and new to join us in games, free play, and structured activities. The days are designed to promote a sense of belonging in a group and nature throughout the seasons as well as being ourselves - engaging our bodies and minds in play. Structured activities link into new and developing skills. These may be based around the fire, handling tools, crafting with woodland resources or construction. All sessions are led by qualified Forest School Leaders. Children 5 - 11 are warmly invited to join us in the woods! Our aim is to provide a fun, supporting environment that fosters a connection with ourselves, each other and nature, building a young community for the day. Typically our days start and end with basecamp routine where we meet, discuss and share. 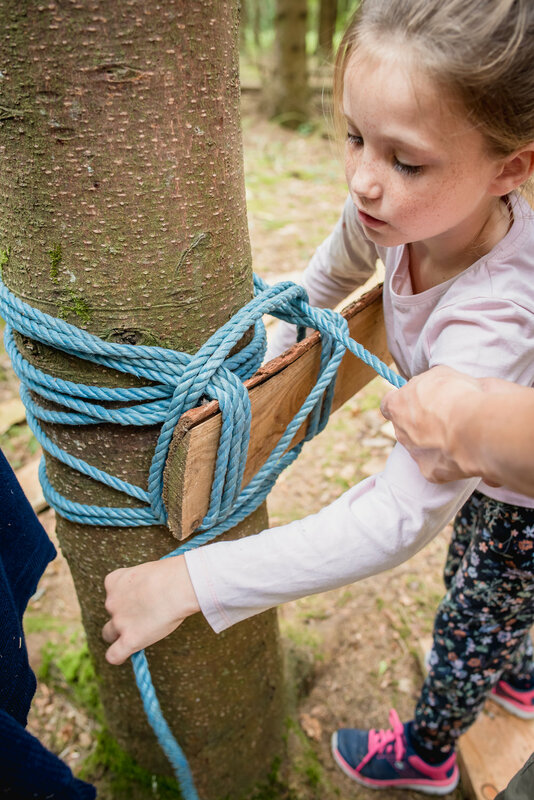 During the day there will be the opportunity to play wide games, learn and mastering greenwood skills, take part in woodland crafts, construct and build shelters or make the most of a day of unstructured time in nature. We let the children take the lead and whole heartedly support the sessions becoming child-led. The sessions are led by Forest School Leaders and supported by an energetic and committed team with childcare, education or outdoor ed backgrounds. Children 8 - 14 yrs are warmly invited to join us in the woods! Typically our days start and end with basecamp routine where we meet, discuss and share. During the day there will be the opportunity to play wide games, learn and mastering greenwood and fire lighting skills, take part in woodland crafts, construct and build shelters, or make the most of a day of unstructured time in nature. We let the children take the lead and whole heartedly support the sessions becoming child-led. The sessions are led by Forest School Leaders and supported by a strong, energetic and committed team with childcare, education or outdoor ed backgrounds. Children aged 5-11 are invited to join us at this magical time of year for woodland and greenwood crafts, firelighting, den building, cooking, games, tool use and free play. Simon of Treecreepers Forest School and Carrie of All Seasons are excited to be offering a structured bushcraft skills day for children and yp aged 8-14. The day assumes no prior knowledge and will consist of two skills workshops: an opportunity to explore and extend our knowledge of fire making processes and using your bushcraft knife to make a fishing spear! Around these focused activities we will be playing games,getting to know each other, connecting with the woods and making and eating popcorn! Around our basecamp routines we aim to connect with ourselves, each other and nature through activities and games alongside the opportunity for free play. Daily structured activities will include foraging and plant ID, firelighting, whittling and hand tools, campfire cooking, seasonal craft and construction. Using the resources around us, our imaginations and the WILD PLAY kit, we actively encourage following the children's interests; no day is the same! We look forward to meeting, exploring and sharing. We welcome old faces and new for Half Term WILD PLAY! Led by qualified Forest School Leaders the days are structured around our social basecamp routines and becoming immersed in nature and doing! Children are invited to take part in structured activities and games or learn and develop new skills using real tools and processes. We support them in following their own intentions, exploring the immediate environment and getting to know themselves and each other at this lovely site in Rodborough. Make a nest for your egg; how high can you get it; how well is it hidden?! This Autumn we welcome familiar faces and new to join us for more WILD PLAY. We will take inspiration from our ancestors and playfully mark this time of year. Around our daily routines and games we will offer craft and cauldron cooking over the fire, fire skills and an introduction to greenwood tools; hammers and nails. As we celebrate the abundant apple harvest and the sun before winter we will offer children the opportunity to make fires and lanterns, besoms (brooms), masks, wands with the opportunity to add lib with creativity. In the spirit of Forest School we will support the children in unstructured play and independent exploration of the environment. Summer WILD PLAY is all about to happen. Days revolve around our basecamp routines - sharing, getting to know each other and lighting the fire and keeping it going! In between there will be wide games, and structured craft, construction, cooking and bushcraft activities and not to forget - the opportunity to explore. In a spirit of play we aim to promote connections with ourselves, each other and nature. 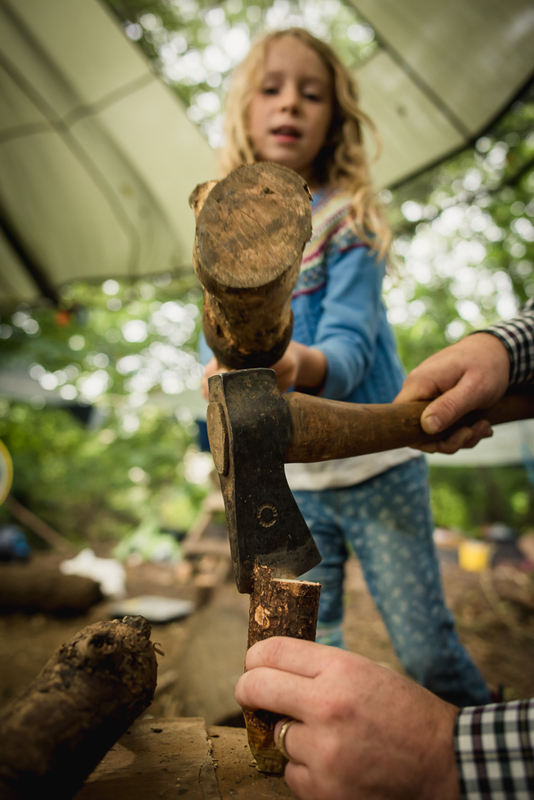 Greenwood craft, campfire cooking, storytelling, dens and more... in a spirit of play. We are returning for more Forest School this coming half term! Expectant and ready for fresh, cold, potentially wet and possibly snowy weather we will be providing structured and free play in the great outdoors - whatever the weather (storm, high winds excepting). we will lead by example; layer up and embrace our environment! Structure will be around the all important skills of firelighting, team challenges and being and sharing together in the basecamp. Offered activities will include greenwood craft, cooking, story telling, den making and bushcraft skills. We continue to support children in implementing their own ideas using the resources they find and their limitless imagination. With Summer Holidays like a distant memory of dappled sun we are thinking ahead to our next holiday and marking the end of Summer and darker but no less vivid days. Join us in the woods for new sights, sounds and smells as we notice the Seasons change and come together again in the woods. We welcome new friends, experiences and ideas. Join us at Cranham Scout Centre where we will be honing our bushcraft skills, keeping the fires burning, building leaf litter shelters, cauldron cooking, crafting with greenwood and clay, stream crossing and exploring. and more!